The best thing about playing casino games online are obviously the winnings that are there for the taking of those lucky and skilled enough to take them. Slots Heaven Casino has now started offering an expansive safari adventure available for one lucky player to go on. With their site already being one of the top rated new online casinos, they've added this extra incentive to play for those willing to test their fortune with a few spins of the wheels. There's no lack of variety for players to see with over 350 slot and casino table games powered by Playtech and the odds are quite good with a payout of 98.9% across the site. Not to mention the sign up and deposit bonus that new users are granted which is worth up to $400, which is 200% of the first deposit needed for this contest. The payment methods are quite broad and accommodating for the player with Credit/Debit, Click2Pay, EcoCard, iDeal, PayPal Casino, Ikash, ClickAndBuy, and MoneyBookers/Skrill all accepted in order to make it easier to get playing and winning. 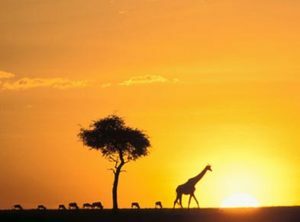 The winner of this bonus promotion will find themselves heading off to the beautiful African plains in Kenya for a journey of exploration with chances of coming across giraffes, lions, elephants, leopards, and, if their casino luck carries forward to the trip, the very rare western black rhino. That's not even taking into account the thrill of taking off to another continent, the beautiful landscapes with exotic flora and fauna, or the fresh air and sunny skies of the Savannah. In just a couple simple steps, you too could be casting your name into the contest to win this once in a lifetime expedition. The first stop is opting in to the contest on the Slots Heaven page. Second, make a cash deposit of at least $50. It's that simple. Every time a deposit of $50 or more is made from there forward, to the cut-off date of April 4th, 2014, another entry goes in to give even more chances for adventure. That's quite the trade off, playing games with a wager of only $50 could see you boarding a plane for beautiful Kenya to take on an African adventure normally worth thousands of dollars which most people will never have the chance to take.